You know – Congress is spending all this time and money going after members of the Congressional Black Caucus. Which in and of itself, isn’t necessarily a bad thing IF there is corruption and malfeasance there. But what about the buying of a Supreme Court Justice? So… Why isn’t Thomas under investigation? Pay for play… Indeed. And that is just the tip of that iceberg. Virginia Thomas, political activist and wife of Supreme Court Justice Clarence Thomas, has decided to relinquish control of Liberty Central, the conservative group she founded less than a year ago, so that the organization can escape the “distractions” of her media celebrity, a spokeswoman said. The call to Hill is not the only controversy surrounding Thomas, however. On the morning she made the phone call, Thomas was the subject of a front-page New York Times article questioning whether her new prominence and acceptance of large, anonymous contributions for Liberty Centra – including two gifts of $500,000 and $50,000 – might raise conflict-of-interest questions for her husband. Lillian McEwen, a former Senate Judiciary Committee lawyer who said she dated Clarence Thomas from 1979 through the mid-1980s, told The Washington Post in an interview that Hill’s long-ago description of Thomas’s behavior resonated with her. “The Clarence I know was certainly capable not only of doing the things that Anita Hill said he did, but it would be totally consistent with the way he lived his personal life then,” said McEwen, who is writing her own memoir but has never before publicly discussed her relationship with Clarence Thomas. McEwen also told the Post she was not surprised that Virginia Thomas would leave Hill a message, even after all these years. The message Virginia Thomas left for Hill again revealed the emotional toll that the Hill hearings took on the soon-to-be justice’s wife. In the past, she has made unsolicited phone calls to voice support for people whose reputations have been shaken by what she sees as false accusations. In one way – I feel for the brother. Despise his politics. Despise his role on the supreme Court, and feel that he is the most destructive force against black America since the KKK. But this is his personal life being dragged out for all to see. Virginia “Ginni” Thomas’ new think tank has something most Tea Party advocates lack: Deep pockets. The wife of Clarence Thomas founded Liberty Central in November with two donations totaling $550,000 that landed it squarely on the map. Thomas, who two years ago retreated to academia to avoid conflicts of interest with her husband’s job, is now very much back in the fray, calling Barack Obama a “hard left” politician pushing the nation toward “tyranny,” Politico reports. The wife of Justice Clarence Thomas has started a “non-profit” to set up a Tea Bagger branch, violating every single rule of non-partisanship and comity. Supreme Court Justices are supposed to maintain a distance above politics, but as we all know the SCUMUS 5 is anything but apolitical. Uncle Tommy Clarence recently attended CPAC, to “see his wife speak” at one of the most extremist political events in the country. 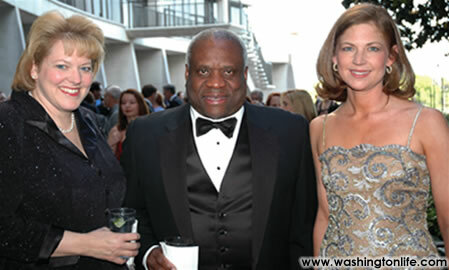 Clarence and Virginia (l) Thomas at a Washington Press Party Last Summer. As Virginia Thomas tells it in her soft-spoken, Midwestern cadence, the story of her involvement in the “tea party” movement is the tale of an average citizen in action. But Thomas is no ordinary activist. She is the wife of Supreme Court Justice Clarence Thomas, and she has launched a tea-party-linked group that could test the traditional notions of political impartiality for the court. In January, Virginia Thomas created Liberty Central Inc., a nonprofit lobbying group whose website will organize activism around a set of conservative “core principles,” she said.